Every time there is an article about buy and hold investing, somebody inevitably is in the comment section with “now show Japan.” This is often used as the knee-jerk response to people like myself, who believe that buying and holding should be the default setting for most people with most of their money. 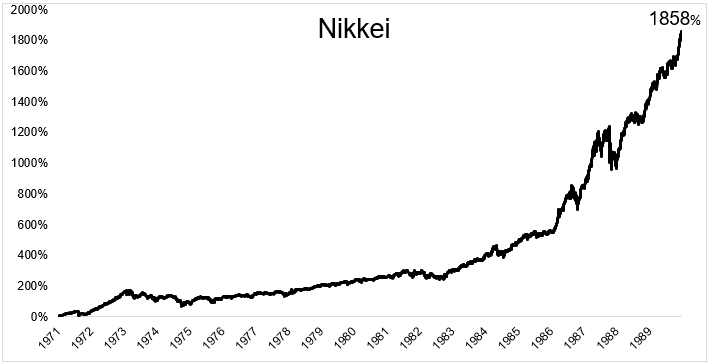 Japan experienced one of the most spectacular stock market bubbles of all time. 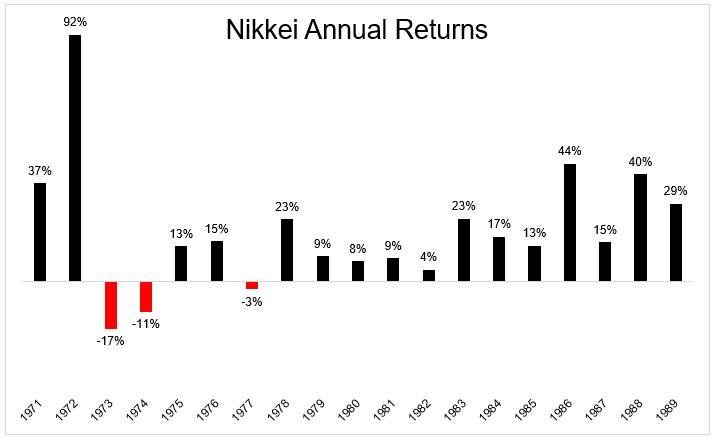 From 1971 to 1989 the Nikkei gained 1858%. An average annual return of 19% for 19 years is something we might not see again for the rest of our lives. 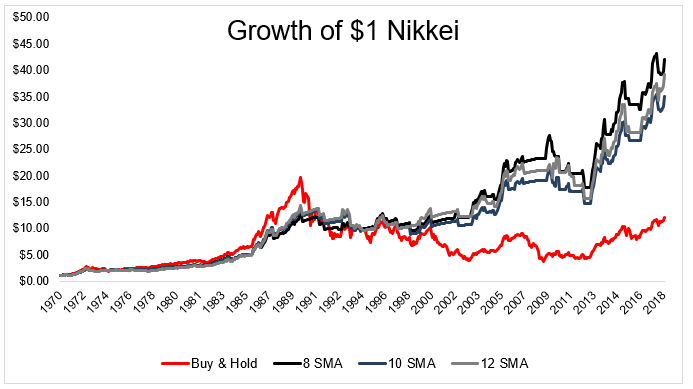 Things got so crazy towards the end of the bubble that the price/sales ratio for the Nikkei hit 2.5x at its peak in 1989. For comparison, at its peak in December 1999, the S&P 500 traded at 2.25x sales. Like all other bubbles, this one popped in spectacular fashion. 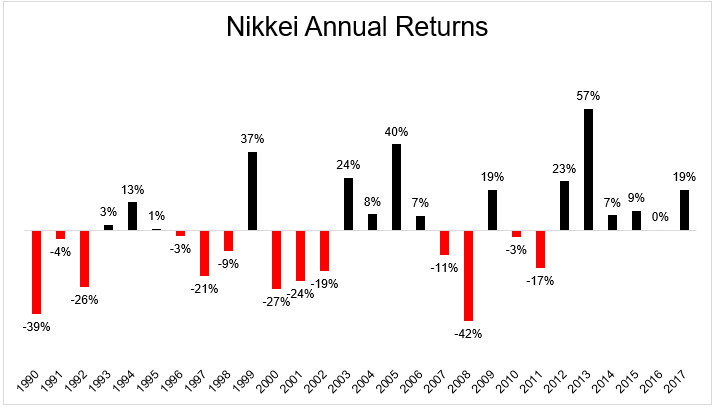 From 1990 to April 2003, the Nikkei fell more than 80%. Even today, nearly 29 years after it peaked, prices are 43% below their highs. There are plenty of lessons to be learned from stock market bubbles, but the idea that they invalidate buy and hold is not one of them. The important thing we should learn from bubbles is that stocks have the potential to fall way past the level of acceptable losses for many investors. Even Jack Bogle himself would have difficulty staying the course during a 30 year bear market. Stock market bubbles and their ensuing bear markets can potentially be mitigated with diversification and a rules-based risk management system. 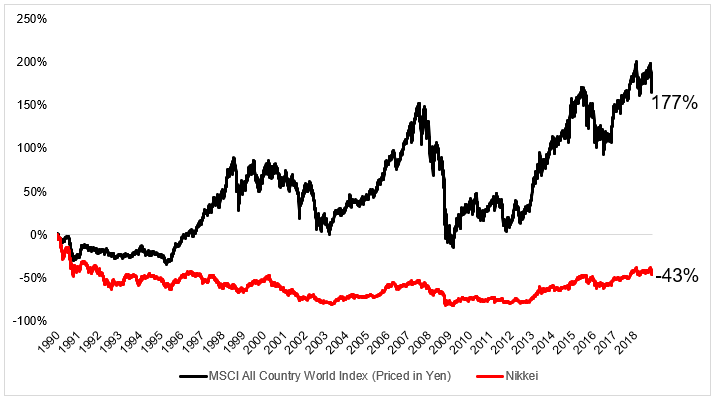 The Nikkei might be down 43% since 1990, but the MSCI All Country World Index, from the perspective of a Japanese investor is up 177% (this is without dividends). Of course we are not promised that global stocks as a group will be higher in the future, but it makes sense to remove single country risk the same way that it makes sense to remove single stock risk. Stocks can lead to ruin. We’ve seen this time and time again. But hoarding cash because stocks carry extraordinary risk is not the appropriate course of action. If this type of risk did not exist, there would be no returns. 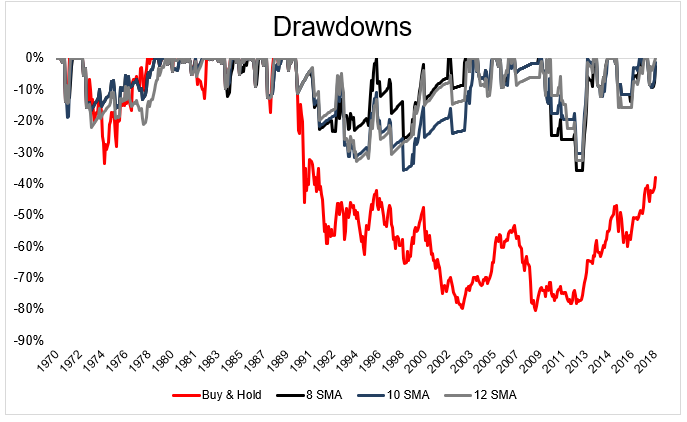 There are ways to sidestep an 80% drawdown. Not all of it of course, but any sort of rules based system would have sold Japanese stocks at some point before the pain was too great to bear. You could have chosen momentum or any number of simple moving averages, which I’ve included as an example below. This chart shows a very simple strategy of buying the Nikkei when it has a monthly close above a moving average and selling when it closes the month below a moving average. When not invested in stocks, this model would have been in 30-day U.S. T-Bills (I couldn’t get Japanese bond returns going back to the early 70s, so I used this as a proxy). Using the 8, 10, or 12-month moving average as a signal would have done significantly better than buy and hold, and more importantly, it would have experienced much more reasonable drawdowns. These models experienced maximum declines of 30-40% depending on the signal, which is far from perfect, but it’s also far from catastrophic. I’m 100% positive that certain countries will punish investors. There will be multiple decades with returns well below what they could have received if they avoided the home country bias. I’m also 100% positive that certain countries will experience bear markets with risk so deep that even the most ardent buy and holders will scream uncle. The way I think about protecting ourselves against these risks is to diversify away from your home country and to implement a rules-based risk management system that will protect you from selling at the point of maximum pain.